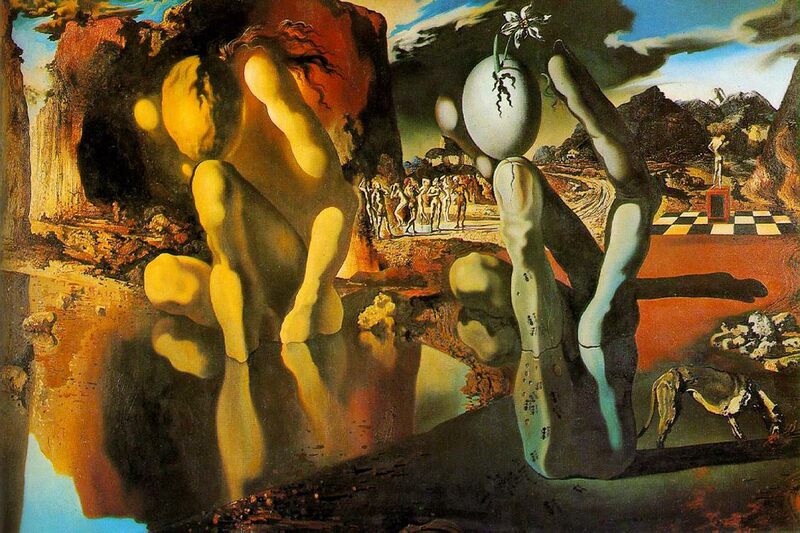 It’s hard to describe the works of Salvador Dalí. 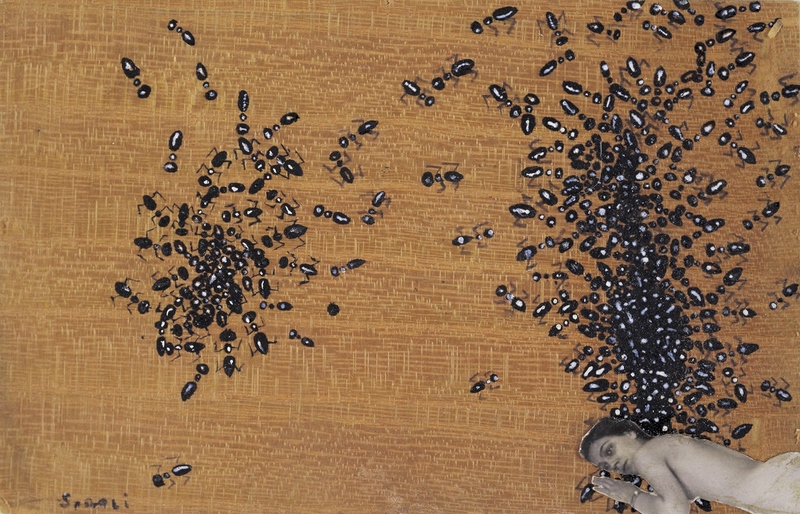 He is an iconoclastic and controversial figure in the art world. Yet he’s much more than that. 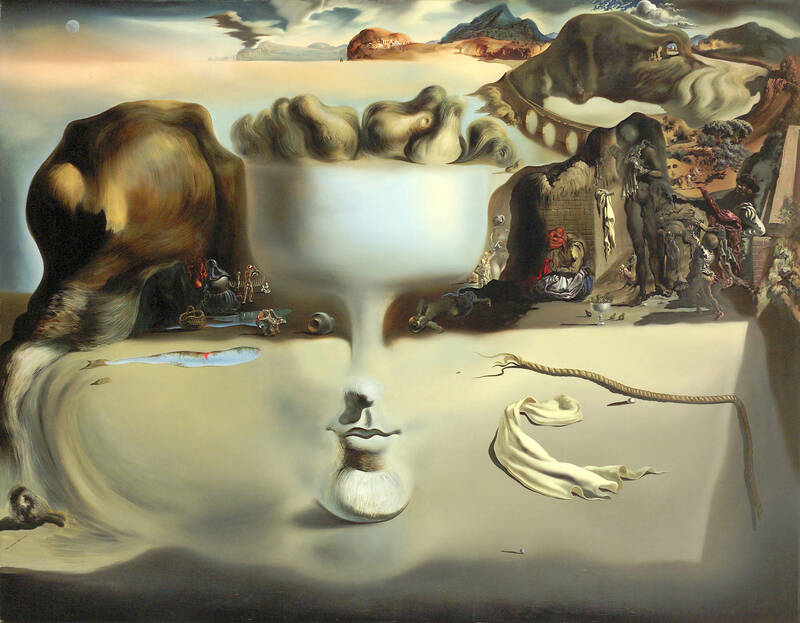 Dalí’s work holds a number of influences and inspirations that set him apart from other artists and make his works almost impossible to categorize. 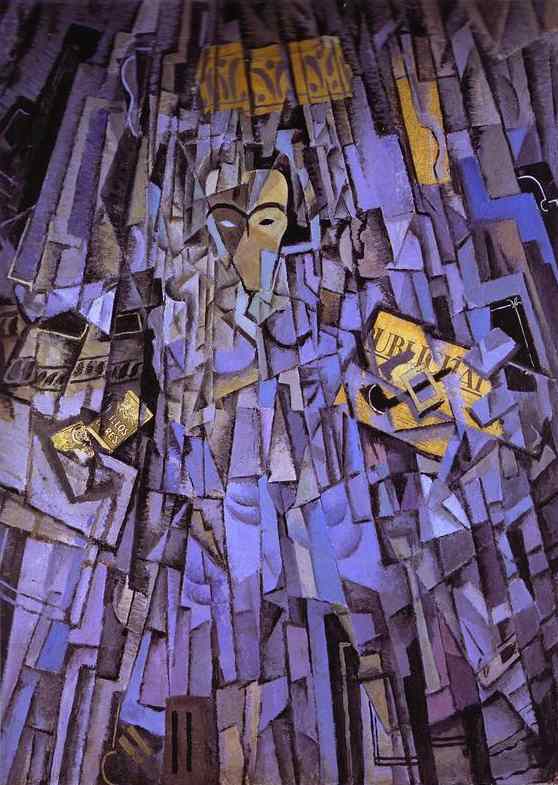 At first glance, he appears to be a surrealist, a modernist, a cubist, and a dadaist. 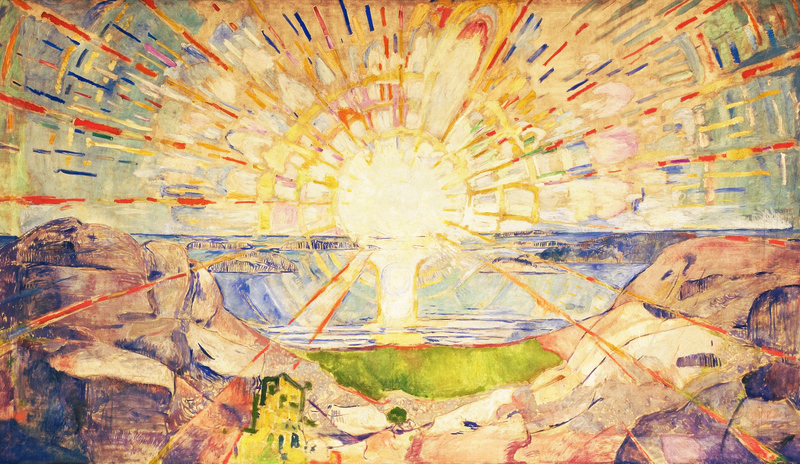 But his paintings, collages, and bizarre three-dimensional works of art also owe much to classical and Renaissance masterpieces. 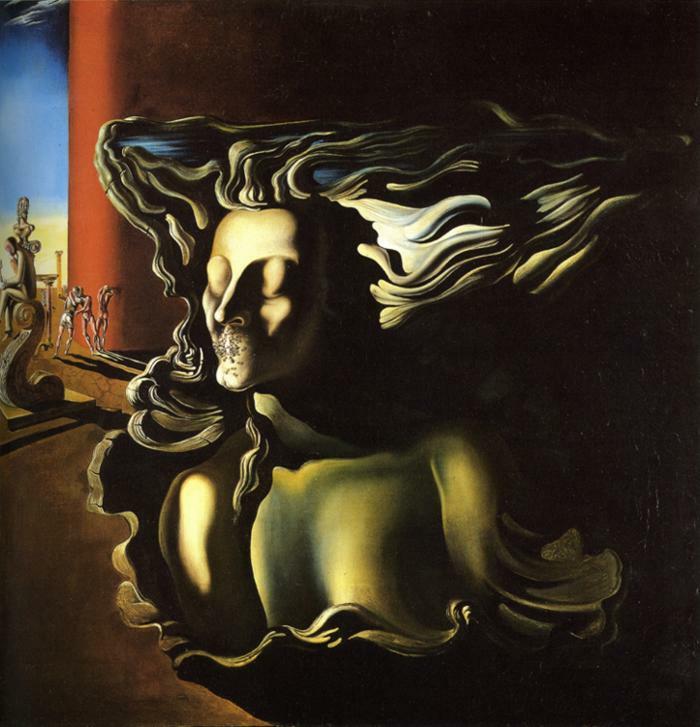 Many critics and art lovers have dismissed Dalí because he was either too eccentric, too commercial, or because they simply failed to understand the pure talent and genius of his creations. 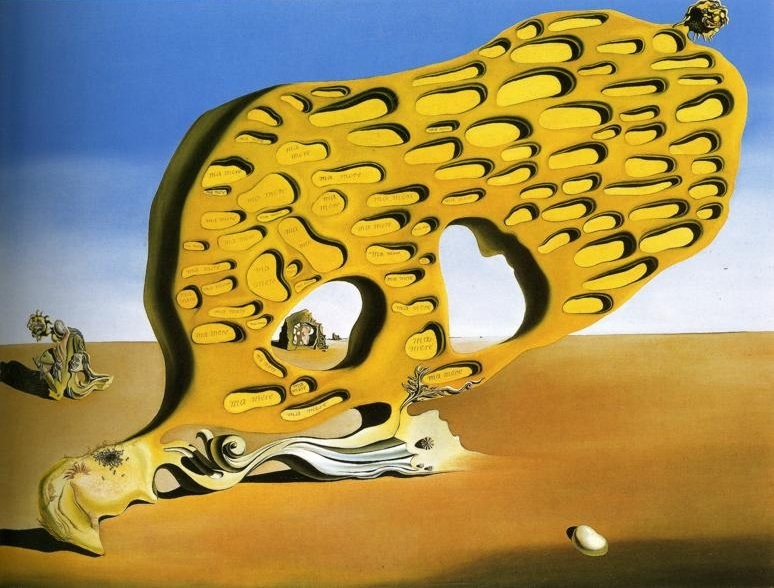 On a personal level, I’ve always been attracted to these images, because they seem to have been born in dreams and were then expressed in a way that we could all experience them as vividly as Dalí himself. 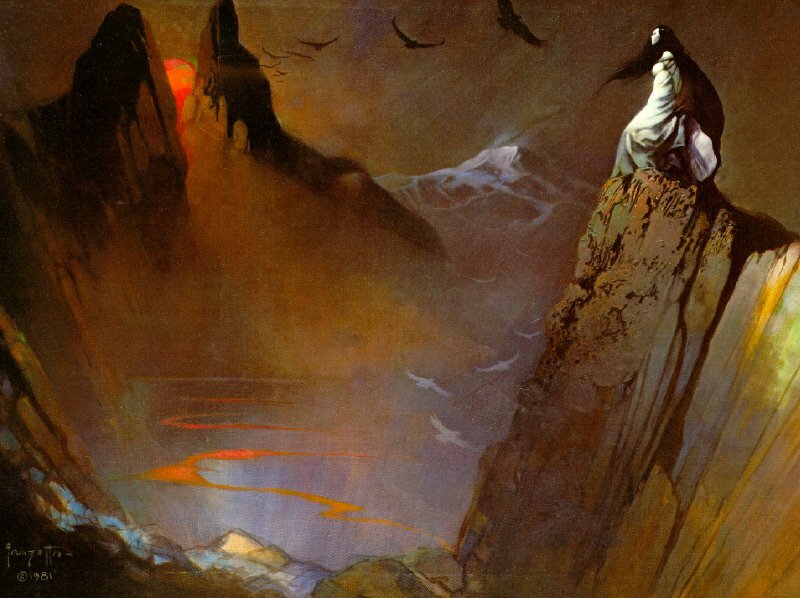 As a genre that spans multiple mediums, fantasy has been able to introduce people to new worlds, new concepts, and encounters that only the imagination could provide. 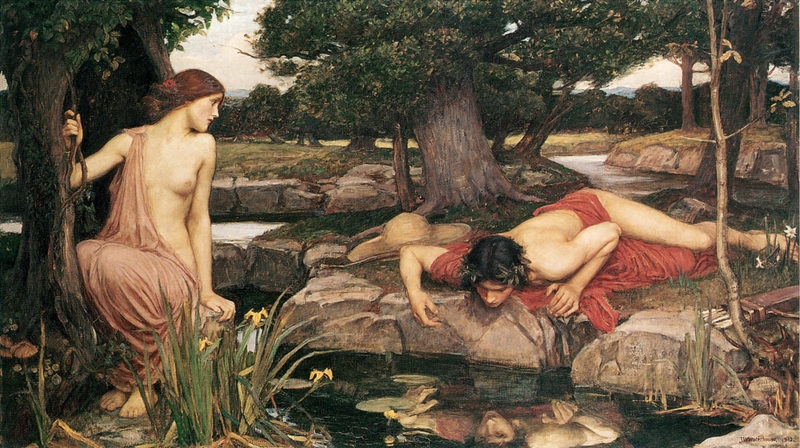 Within the art world, very few fantasy artists have ever been given the credit that they deserve for their artistic work. 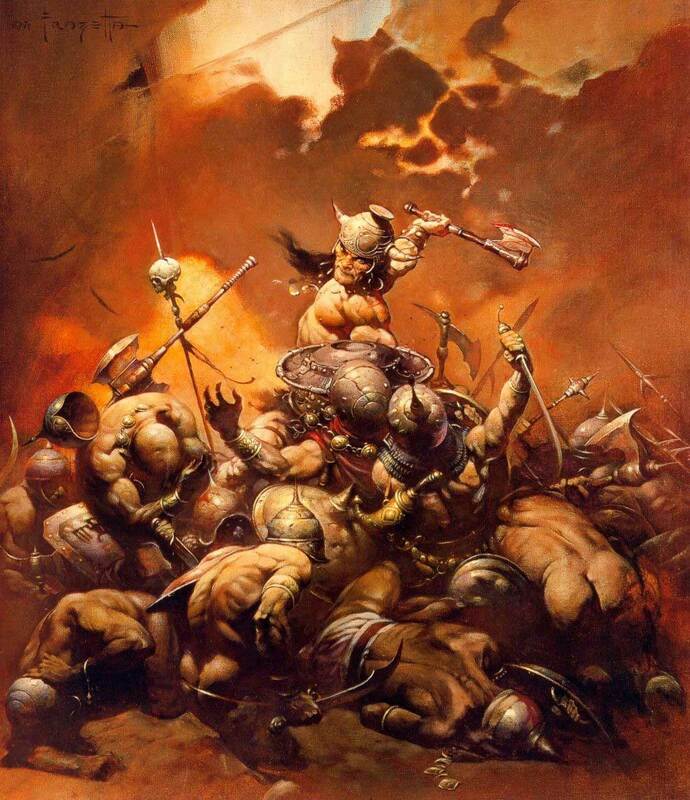 Aesthetically, fantasy in art is usually comprised of scenes of scantily clad barbarian men and women battling with supernatural forces, though there are other kinds of fantasy art. 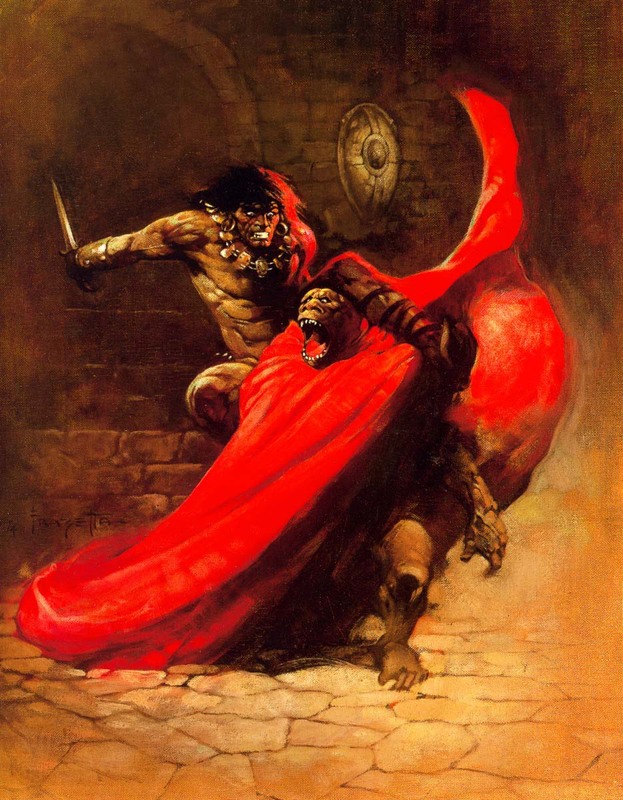 However, when it comes to “pulp fantasy”, as I often refer to it, no artist has ever had the kind of cultural impact and influence that Frank Frazetta has. His works have pushed the envelope in ways that are almost indescribable. 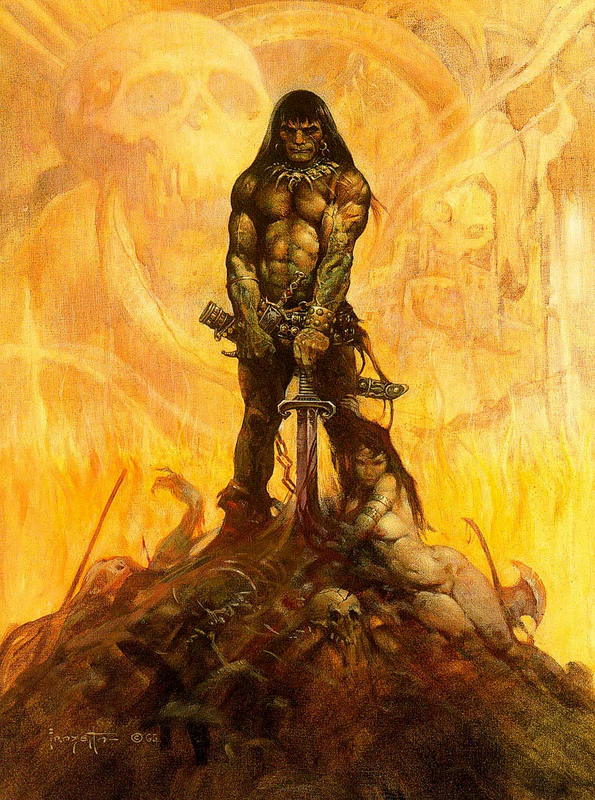 The men he draws are muscle-bound and rippling with testosterone; the women are voluptuous sensual creatures who can barely stand due to their feminine endowments; the monsters are as grotesque and as savage could be. 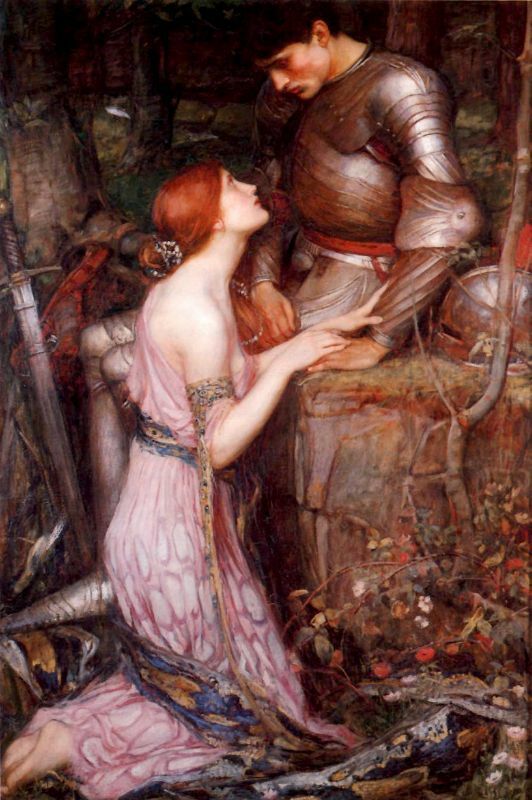 I’ve been a great admirer of the Pre-Raphaelite Brotherhood and their artistic style for a very long time now. 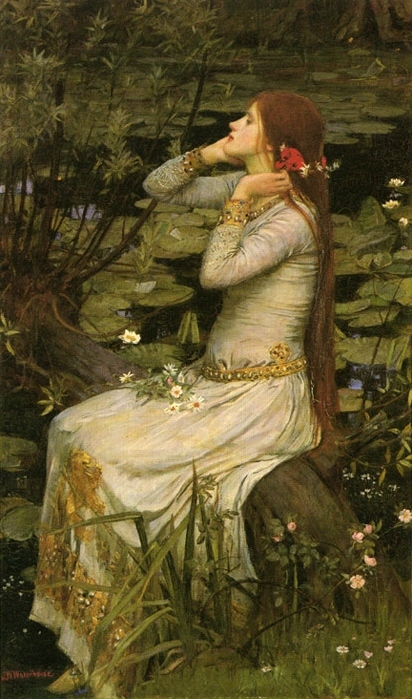 Of all the artists associated with the movement, I think that John William Waterhouse is probably my favorite. 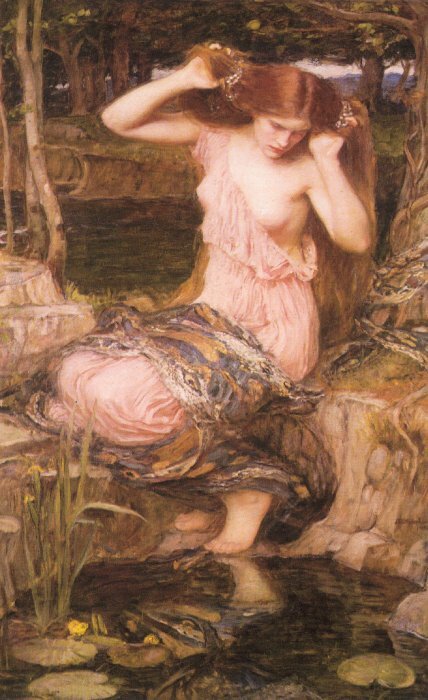 This is partly because Waterhouse was consistently brilliant in his creation of evocative scenes inspired by mythology, historical legend, and classic literature. 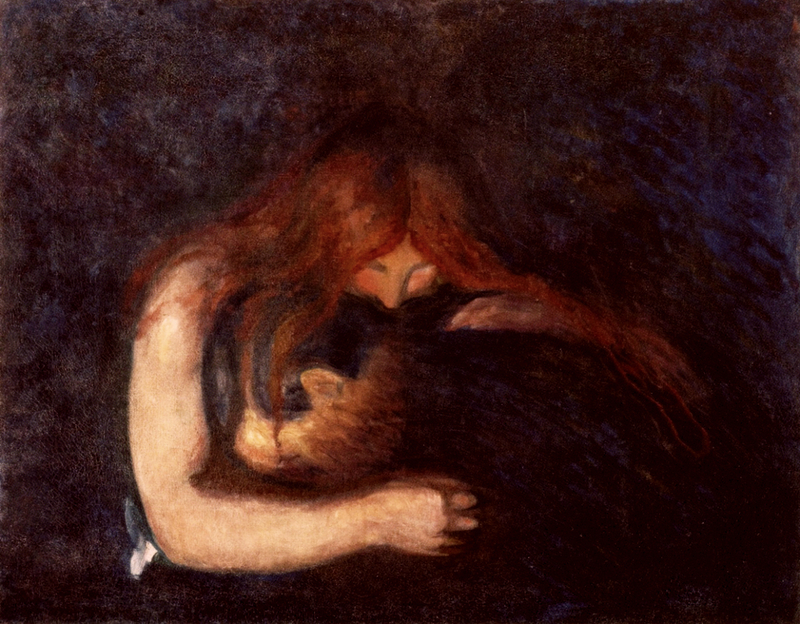 However, while this aspect of his art appeals to me on an intellectual level, I find myself also drawn in by the delicate sense of bittersweet romance and unrequited love on an emotional level. Waterhouse created images of women who were more than mortal women. 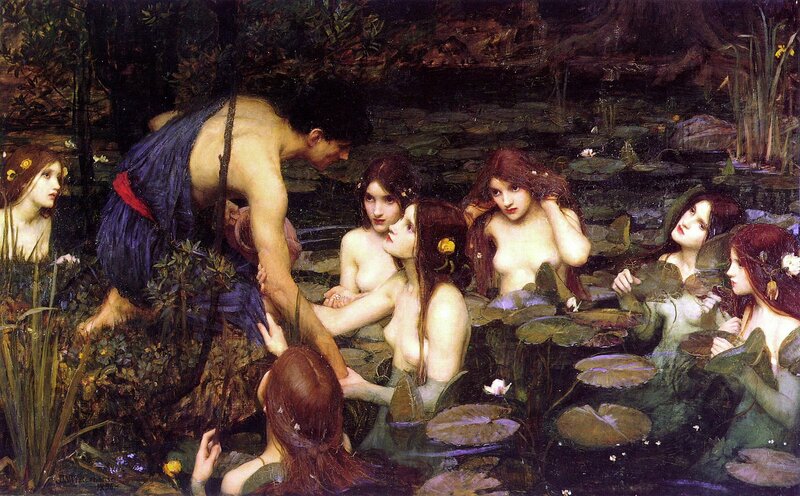 They are beautiful, seductive, and melancholy representations of our collective longings manifested on the canvas of a master. 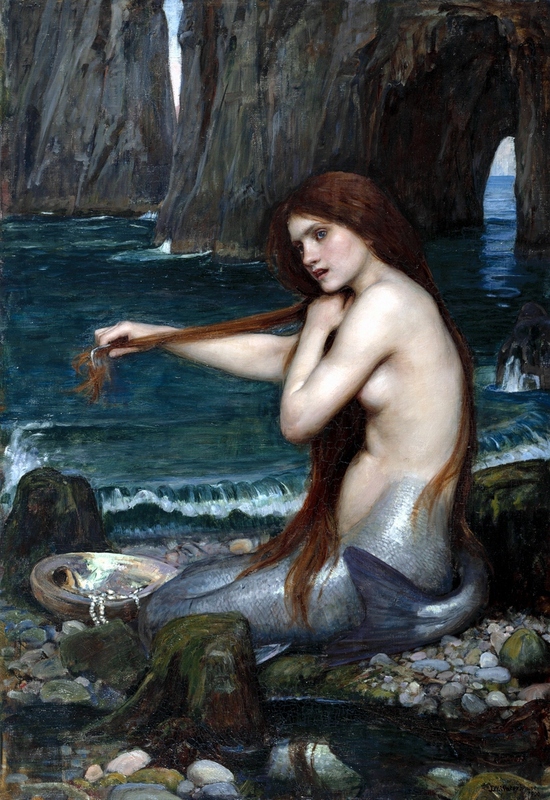 Waterhouse was one of the last Pre-Raphaelite artists and yet his work overshadows many of the lesser known artists of the movement who came before him. 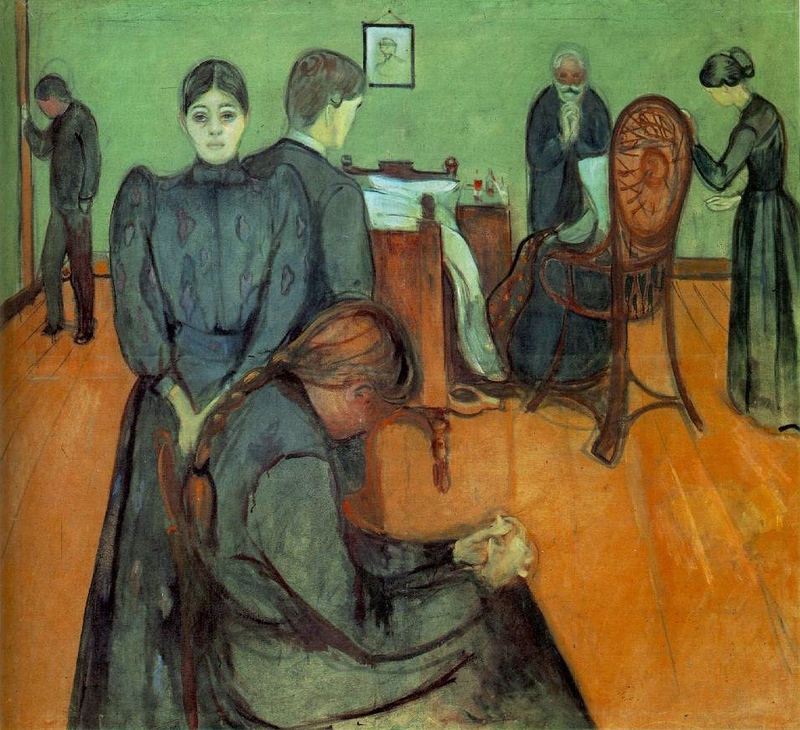 Originally written and published for Century Guild’s blog on January 17, 2012. Jeremy Bastian isn’t your typical artist by any means. Not only is he the creator, writer, and illustrator of the increasingly popular indie comic Cursed Pirate Girl, he’s also an extraordinarily talented and dedicated artist outside of the medium. What makes his work so special is that Jeremy’s influences are multi-generational. 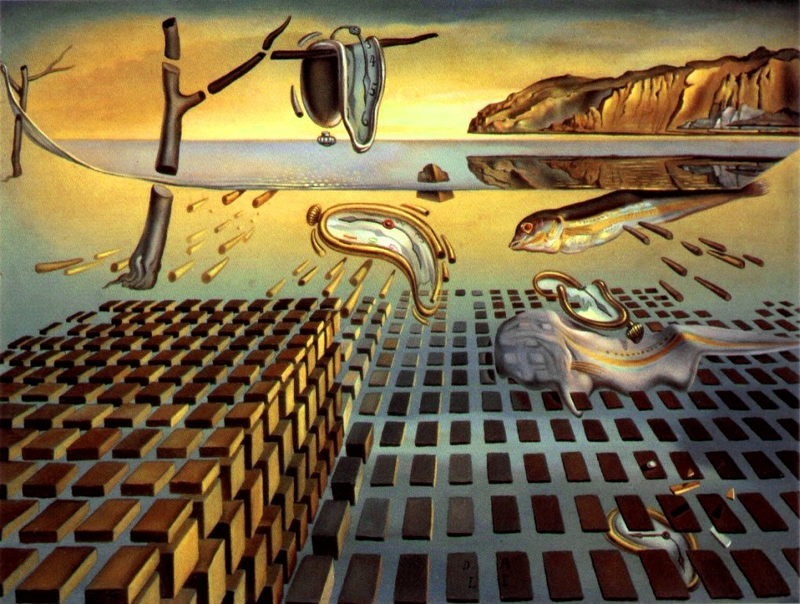 They span not only different eras of art, but different genres and mediums as well. 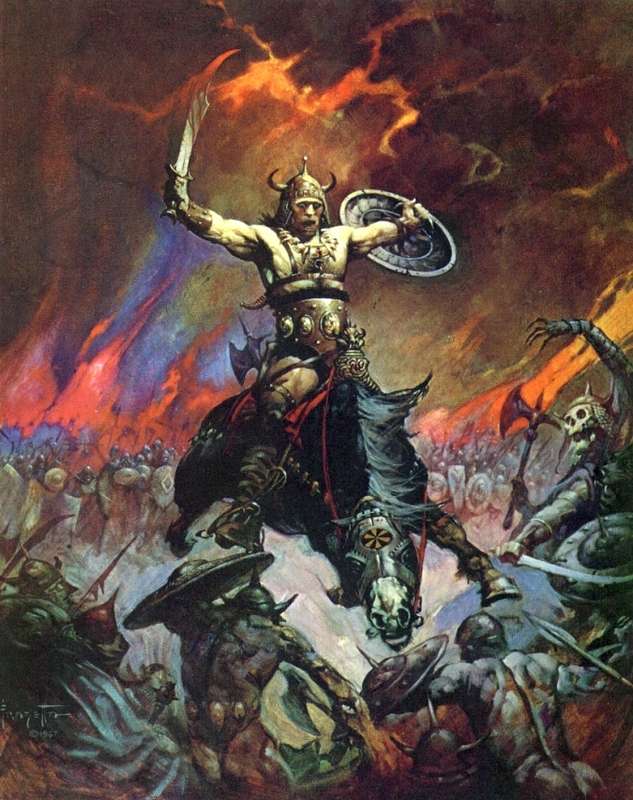 His work is distinct not only its style and aesthetic which is informed by the classic illustrators of the 19th and 20th centuries, but also by such diverse sources as medieval, Renaissance, and comic book artists. 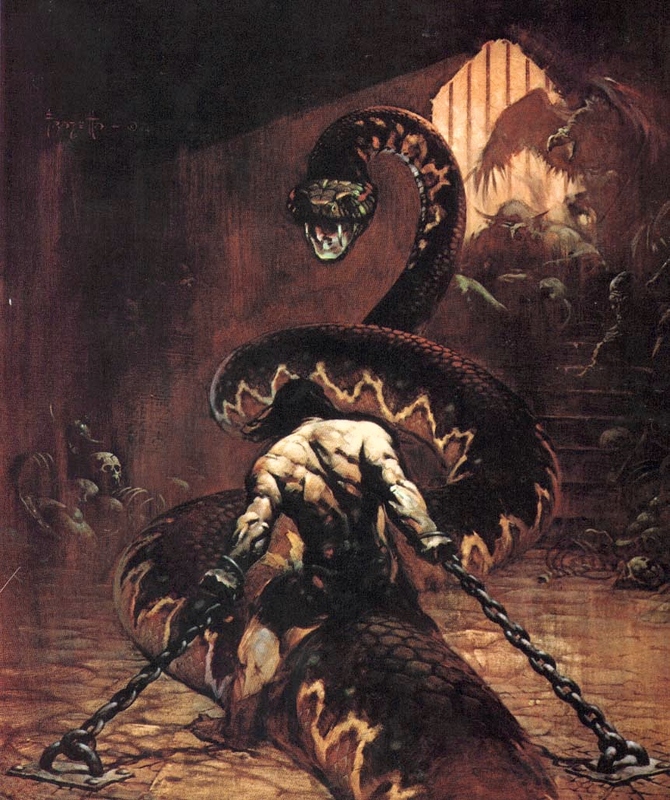 While many comic book artists look to other comic book artists for inspiration, Jeremy acknowledges a wider range of artistic inspiration than many and derives that inspiration from varied material. 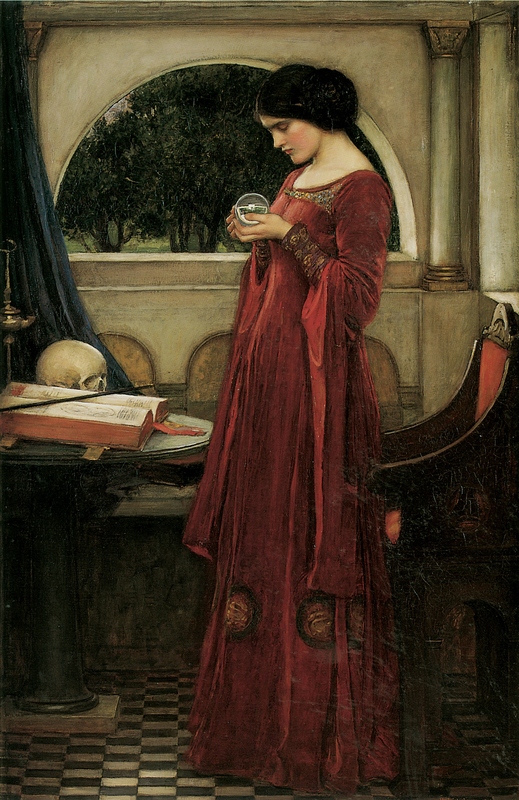 Looking over his art, one can see traces of classic illustrators like Richard Dadd, John Tenniel, Gustave Doré, and Arthur Rackham, but also strong elements found in certain medieval artists’ work, such as Martin Schongauer and Hieronymus Bosch. 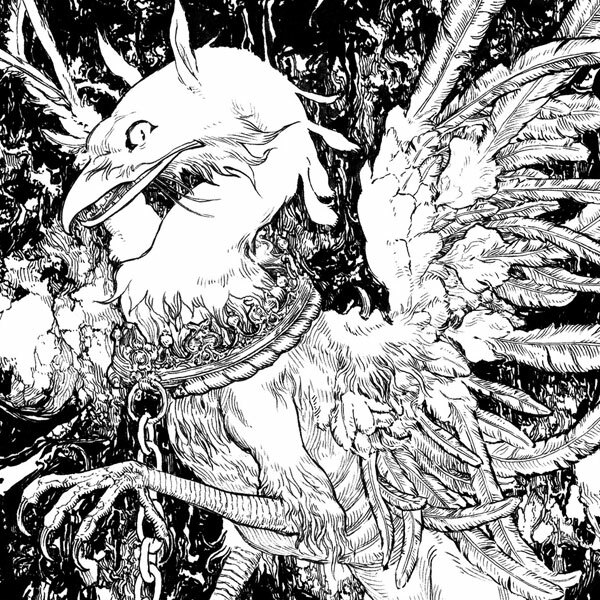 A detail of Bastian’s “The Griffon” shows just how much effort goes into a single artwork. 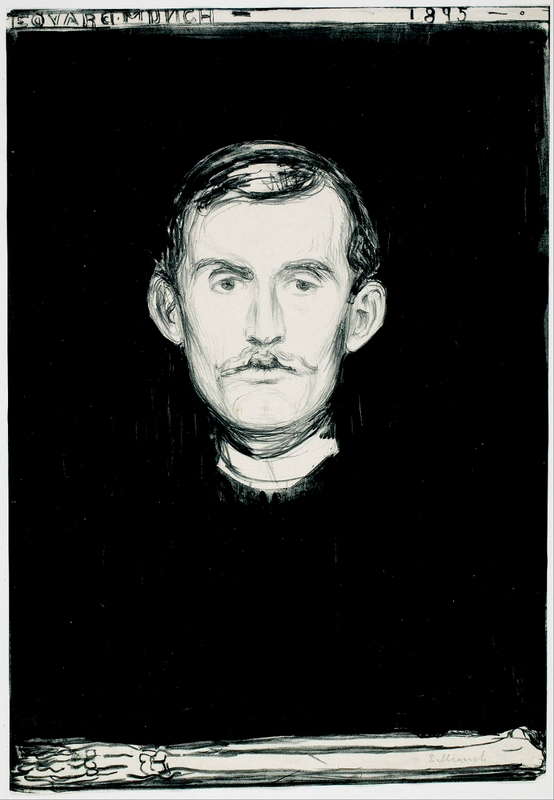 This piece, measuring less than an 8.5 x 11″ sheet of paper, was created using his signature technique of fine lines of ink laid down using single-haired brushes. 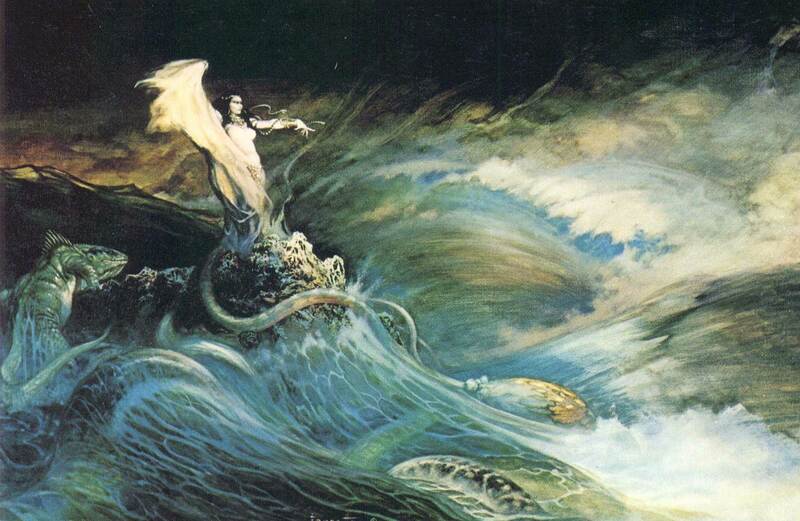 Gustave Doré would approve! 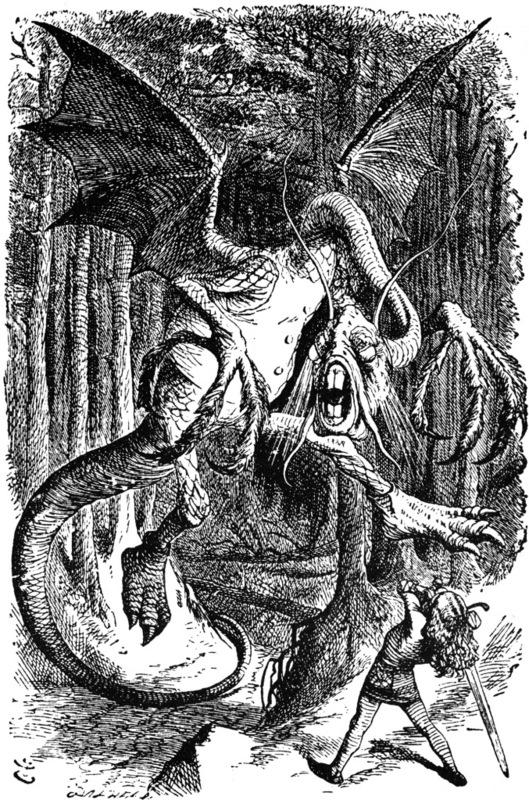 “The Jabberwock” by John Tenniel, from “Through the Looking-Glass”, foreshadows Jeremy’s combination of childlike whimsy and grotesque fantasy creatures. 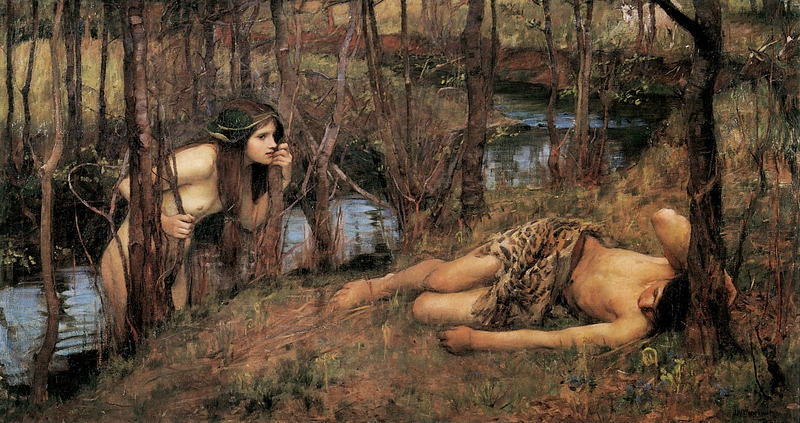 But Jeremy’s work is so much more than just the sum of its parts or the accumulative result of work by earlier artists. His own unique sensibilities and personality shine through. 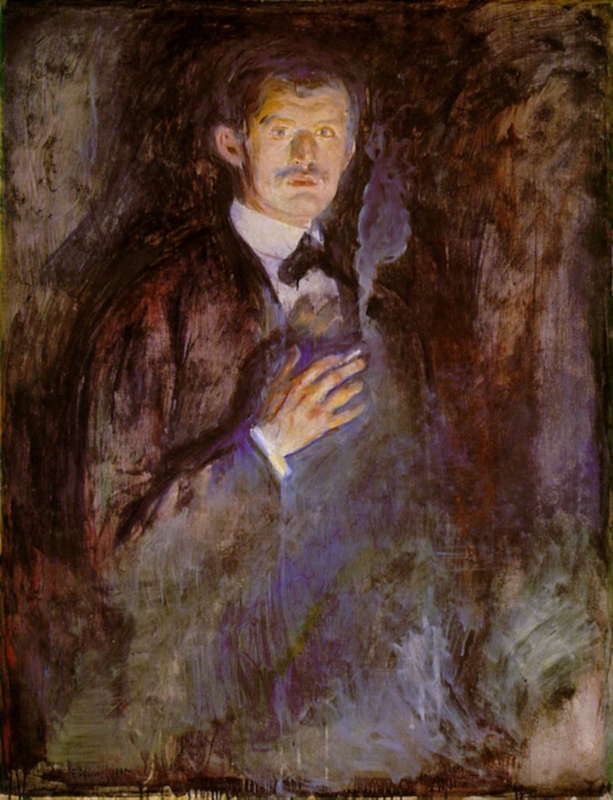 His skillful hand rivals and even surpasses those of many of his predecessors and contemporaries. How did you meet Thomas [Negovan] and become involved with Century Guild and Olympian Publishing? At the time I had been trying to self-publish Cursed Pirate Girl. I had showed it to a friend of mine, Douglas Klauba, and he showed it to his friend Tom. He had said, “I have to get a hold of this guy,” and it wasn’t until a Wizard World show that we met. He had said, “You know I’ve been trying to email you… I’ve been publishing a couple of books and I’d really like to publish yours”. At that time I had already signed with Archaia because I was first going to do the books through Archaia, but it was going to be in color since they had only published color books at that time. They wanted to see it in color, but I really wanted it as a black and white book; that’s how I saw it. I had even started to color it. I had colored Issues #1 and #2, but then they had some slight problems within the company [Archaia was bought by Kunoichi in 2008], and by that time I had been talking with Tom a lot more. He had come over and visited where we were living in Michigan and bought a bunch of my original art. Basically, so I could cut back on my hours at my part-time job and concentrate more on working on the book and getting more artwork done, when Archaia was having their internal problems, Mark Smylie from Archaia said, “If you want to shop your book around to other publishers, feel free to. I’m really sorry that all this is happening.” Then Tom just made me an offer that I couldn’t refuse. He really saw it as a black and white book and he got what it was all about – the sense and style and aesthetic – and that’s how I first started out with my books coming out from Olympian. 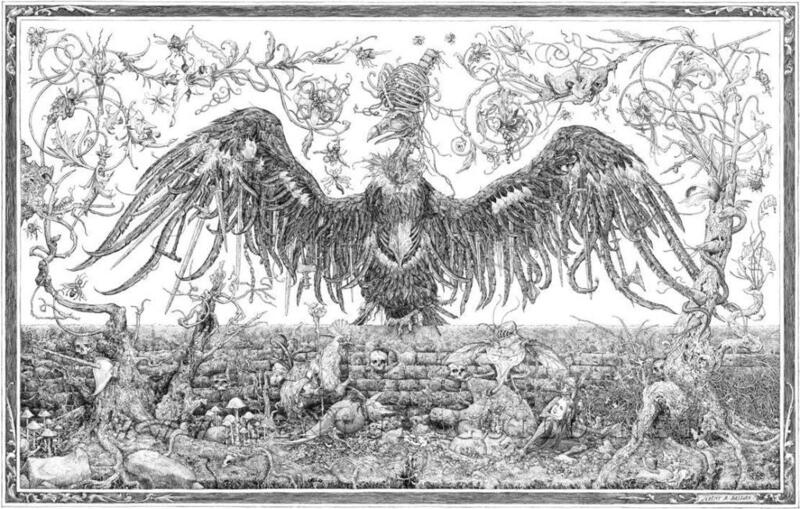 Jeremy A. Bastian’s colossally epic and extraordinarily detailed masterpiece, “The Sacking of the Royal City of Cub” (Ink on paper, 2011), made exclusively for the patrons of his unprecedented Kickstarter campaign. 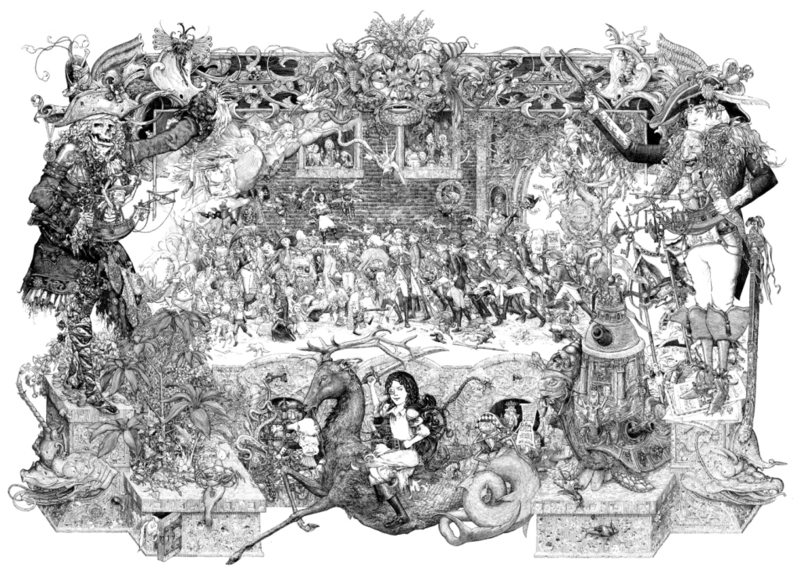 This monumental piece was created over the course of three months and features a plethora of eccentric characters from the “Cursed Pirate Girl” universe. Looking over this, one might require the aid of a magnifying glass, or even a microscope, to appreciate the level of detail in the intricacies of the line work. Even the smallest portions are full of narrative imagery and characters. No detail is arbitrary! 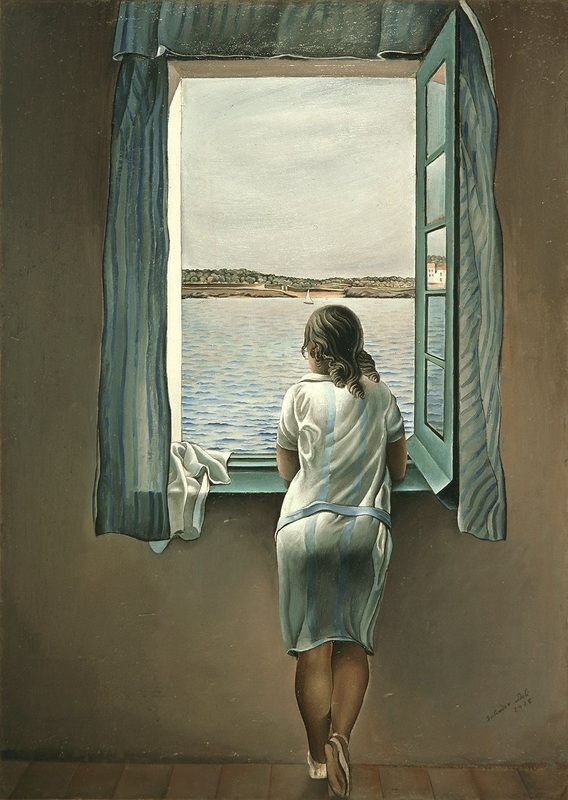 What made you realize you wanted to pursue a career as an artist? Well, I knew that I had wanted to do that since I was like six, you know. It was really the only thing I could do. I didn’t have too many friends in school and whatnot, so drawing was the one thing that I did that got me a little bit of attention and made me feel like I had a purpose. I had a cousin who was into comics and was into Uncanny X-Men and she knew all about stuff like that. So, she really introduced me to comics and she even had her own little self-published comic she was working on, and I just thought that was amazing! I was like, “Oh, wow!” So, when she would babysit me and my brother, she’d show us issues. She was copying the style of Marc Silvestri like perfectly, so I started to do that and began to build up [knowledge] of anatomy and all that, and just knew that was what I wanted to do for the rest of my life. Who would you cite as being some of your greatest inspirations or influences in terms of developing your own unique aesthetic and style? It has been a long journey as far as that goes. My favorite comic book artist is Mike Mignola and I didn’t get into Mike’s work until pretty late into Hellboy. I think he had three or four graphic novels of Hellboy out and lots of people were talking about him, so I decided to check it out. Once I picked up one, I immediately had to go back and pick up more and as the others came out I bought those. It was almost like an addiction and I just had to get more because it was the first time I had seen something in comics that I really considered artwork. 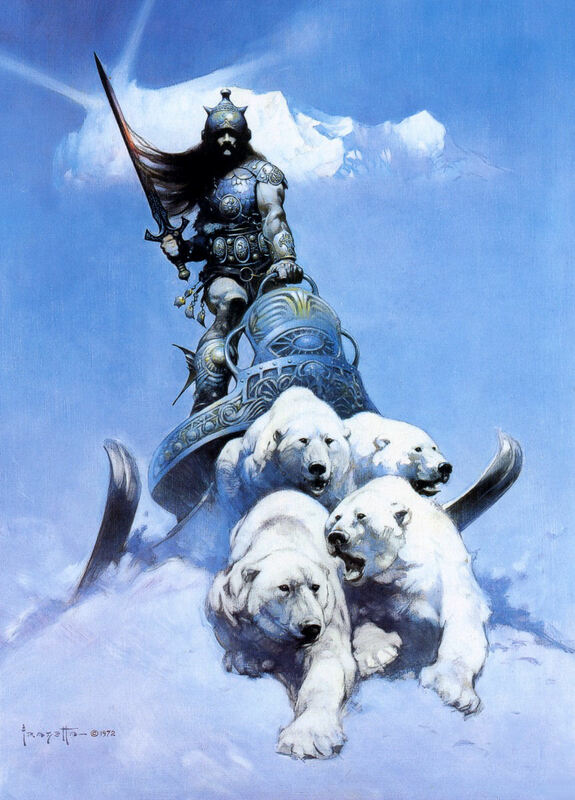 I love comic book art, and Jim Lee and Arthur Adams and those guys, and that was comic book storytelling art. But then when I started reading Hellboy; it was just ‘wow.’ He put so much into it and there’s so much atmosphere and it’s so iconic. Very graphic. I went to school for graphic design in Pittsburgh , but I wanted to do comics. They showed me a couple of samples for comic book pages and some of the work for their graphic design course, and that’s how I decided to go there. 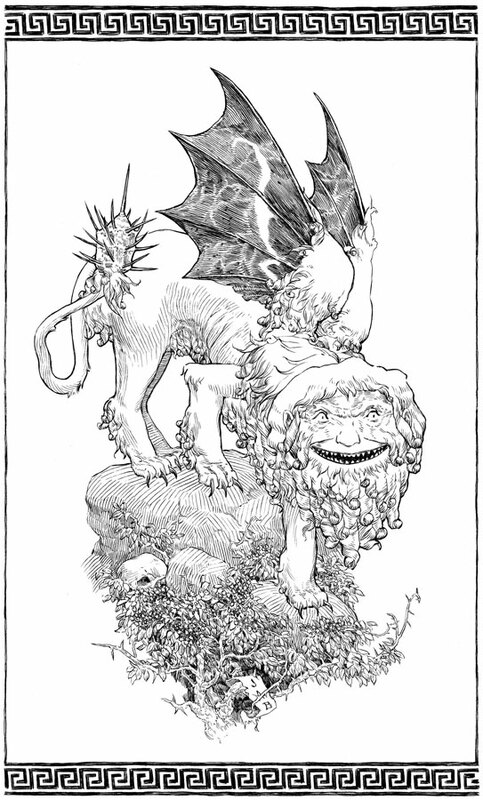 I kind of tried to ink in Mike’s style for a while, and I tried to ink like Arthur Adams as well, but it wasn’t until I was working in an art store in Ypsilanti, where I grew up, that I really started getting into Arthur Rackham, Gustave Doré, and Albrecht Dürer. They had all these reference books that they were in and their stuff was just amazing. It’s sort of where Cursed Pirate Girl comes from now, being mainly influenced from old etchings and wood-cut blocks. 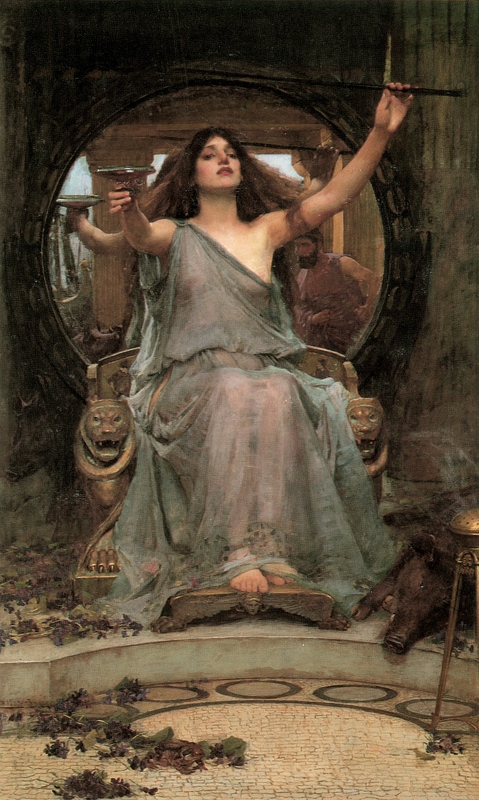 Jeremy cites Gustave Doré as one of his influences. 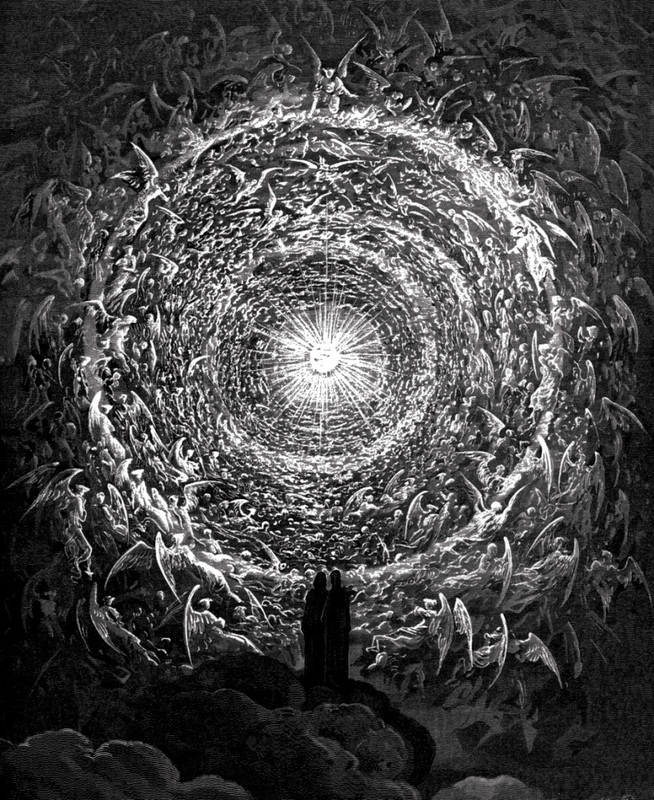 One can see the same incredible attention to detail in Doré’s illustration, such as this one entitled “The Empyrean” from Dante’s “Paradiso”. Like Doré, Jeremy is intent upon creating the most intricate line work and he is easily as methodical… perhaps more so. Are you also a fan of Harry Clarke? Oh, yeah. I recently discovered him. There are a lot of artists and illustrators that I was very bummed that I hadn’t heard about them earlier when I was going to school. 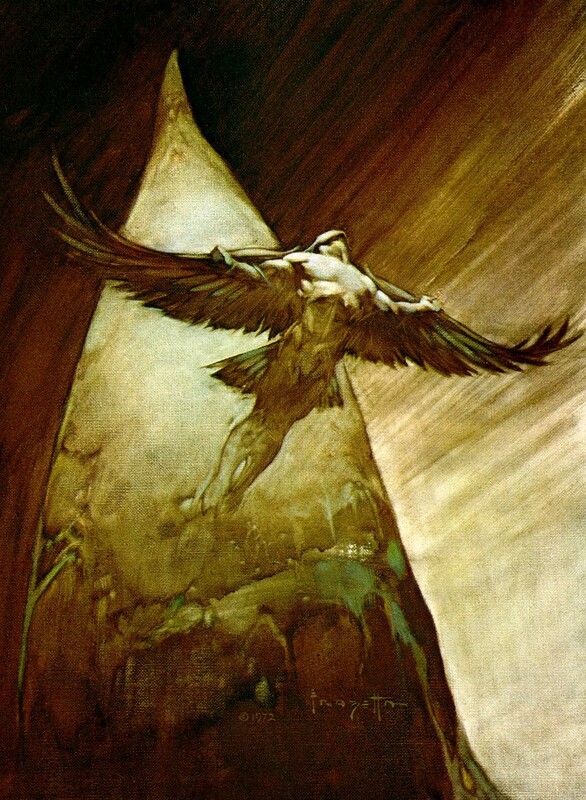 I took an illustration cert track and they never covered a lot of these guys like Franklin Booth, Harry Clarke, Walter Crane, and H.J. Ford. There’s just a whole bunch of artists that I’ve come across, and then discovered other artists through following other artists’ work and from getting children’s books and anthology books with illustrations from different artists. 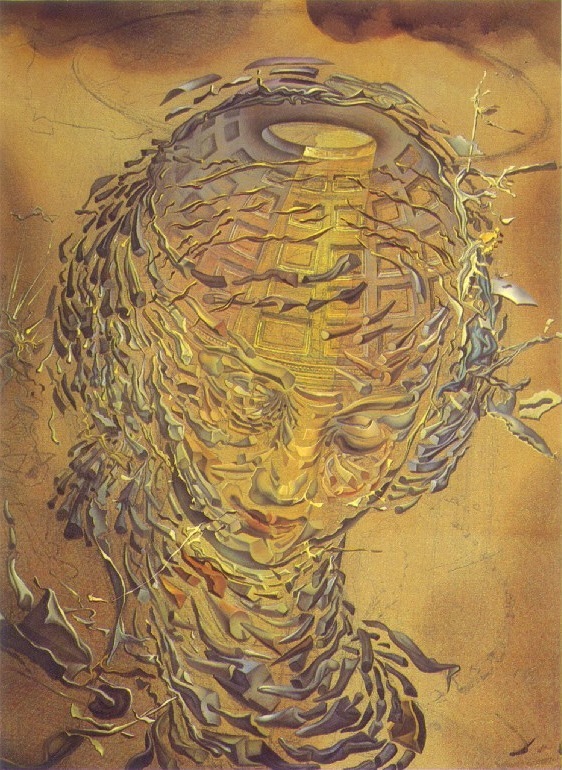 Some of my more contemporary influences are children’s book illustrators like Gennady Spirin, Olga Dugina, and Andrej Dugin, or Kinuko Craft. They’re these great illustrators that have a kind of old-time feel to them. 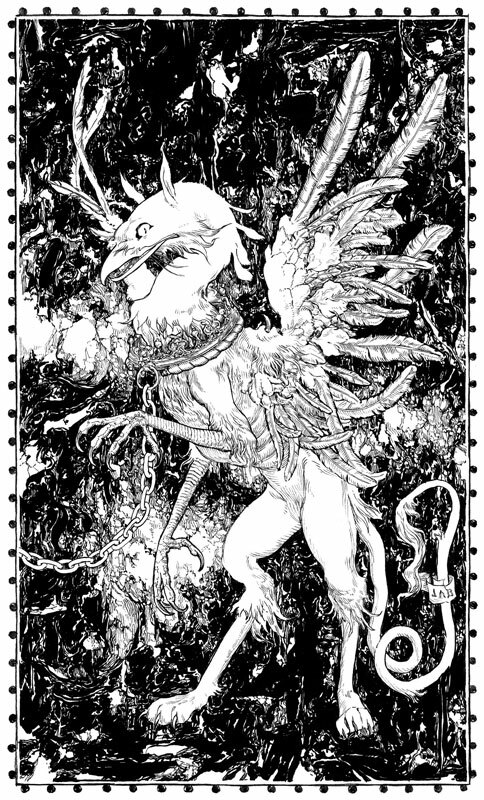 And there are other artists that I really like, like Vania Zouravliov and Aaron Horkey. 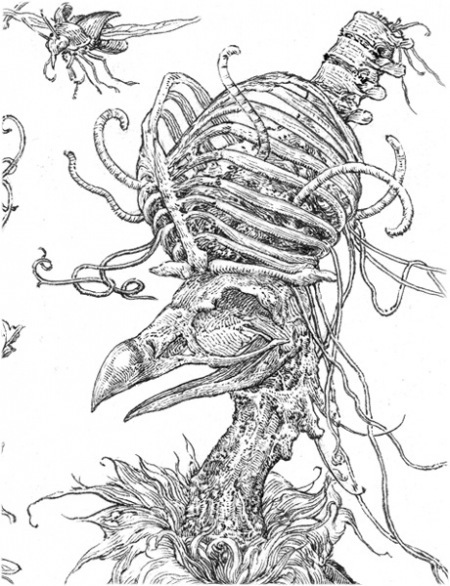 I actually had the great fortune to meet Aaron Horkey at the San Diego Comic-Con this past year and it was great talking to him and gushing over his work. He’s another really nice gentleman… does wonderful line art. 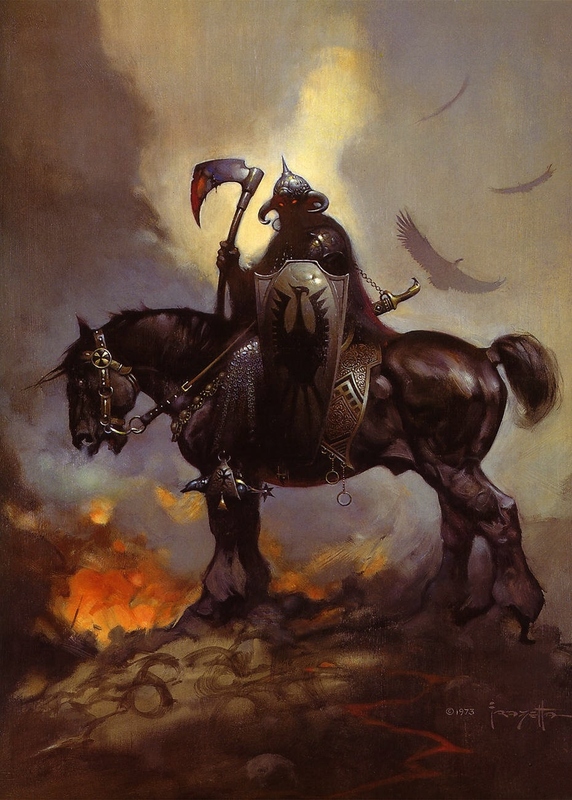 (Detail from Jeremy A. Bastian’s “The Last Witch’s Head at the Wall of Man’s Demise”) It’s in the strange characters such as these that you can see similarities with Bosch and his bizarre denizens of Hell. Jeremy A. Bastian’s macabre masterpiece for the “Grand Guignol II – HÄXAN” show, “The Last Witch’s Head at the Wall of Man’s Demise” (Ink on paper, 2011). While some artists are content to spend a weekend on a particular painting or drawing, Jeremy thrives on pushing himself to create the most elaborate and intricate work. Sometimes this means that he will spend months on creating a single piece, but the result is, as you can see, breathtaking. 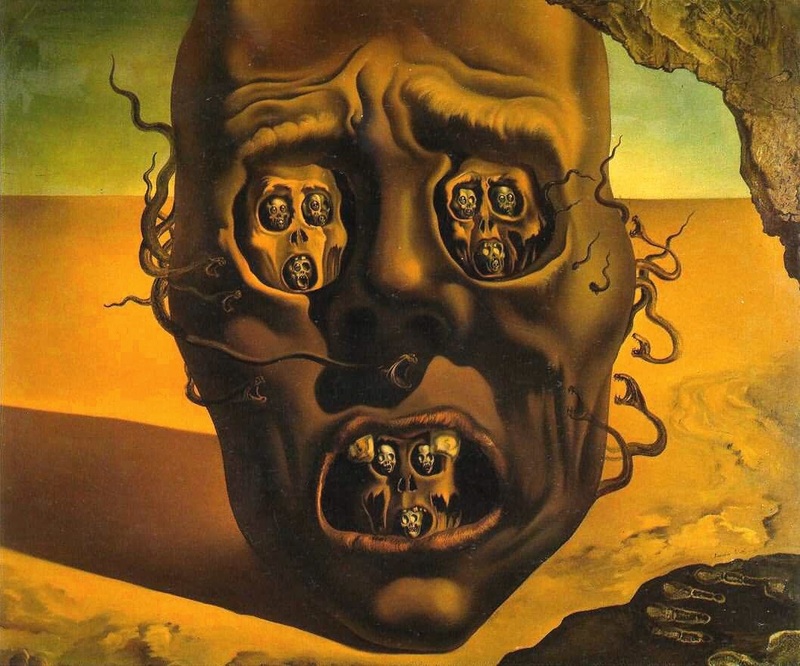 For Century Guild’s exhibition, Grand Guignol II: HÄXAN– Satan + The Women Who Love Him, you created an elaborately detailed piece entitled “The Last Witch’s Head at the Wall of Man’s Demise”. Could you walk me through the process of how you came up with the idea for this piece and how you created it? 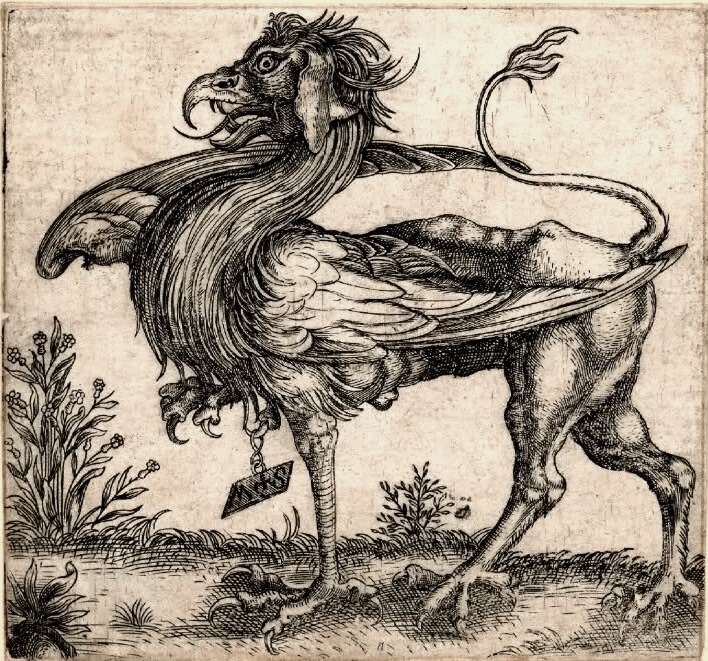 I did a small pencil illustration of a vulture-like creature with a skull for a head and blades hanging from his wings a long time ago and Tom really liked that. He told me I should do a whole vulture piece. He wanted me to do that. I decided to do a full-size vulture piece and this was right after the poster I did as an added extra for Kickstarter. In that I had done a lot of rock work or stone work, so I really liked the idea of doing a weird wall with skulls and moss crawling up it. So, for three months it was me sort of channeling my inner Bosch as far as the foreground characters go. I just wanted to make it bizarre… and keep it in line with previous work I had done. 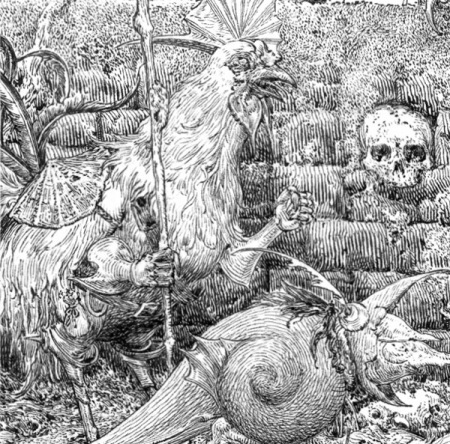 (Detail from Jeremy A. Bastian’s “The Last Witch’s Head at the Wall of Man’s Demise”) Crowned with the ribcage of some unfortunate soul, the Bird of Death stares out of empty eye sockets casting a menacing gaze over the goings on below. 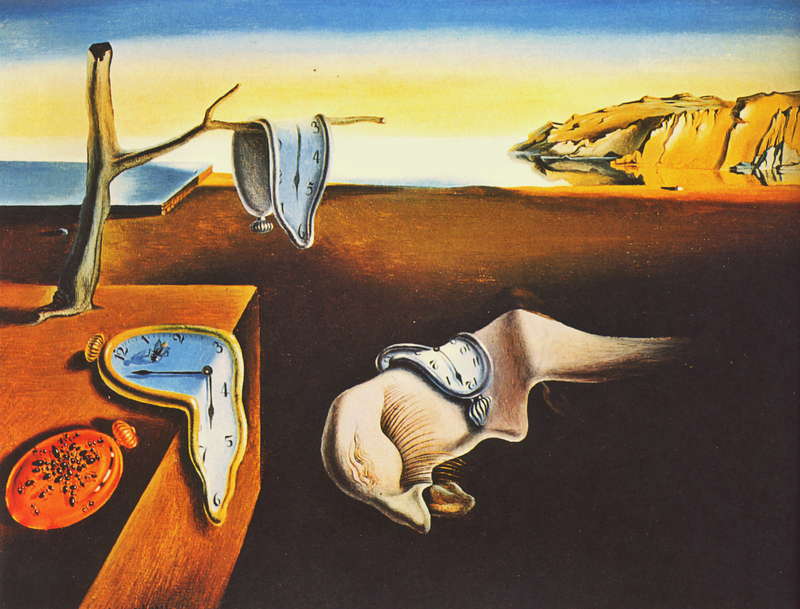 Now, your work is incredibly detailed, both in regards to your intricate line work as well as to the multitude of characters and visual motifs that you use, so how long does it take you to complete a piece on average? Well, it has changed since when I first started. I think I was much quicker, but I can’t remember exactly how quickly it was. I do know that now it takes about a week per page. I got more obsessed with just how much detail I can put into things. I think for book one, I was using a size zero brush and now I’m working with a double zero brush, so I use a much smaller brush sometimes. For me, it’s a personal challenge to see how much I can put into something and try to outdo the last page I did and to have an evolutionary process. That’s why I’m afraid sometimes that I’ll never get it done. I know that I will get it done, but it will take a long time, and I hope that many of my fans will decide to stick in there because they want to see it in print. 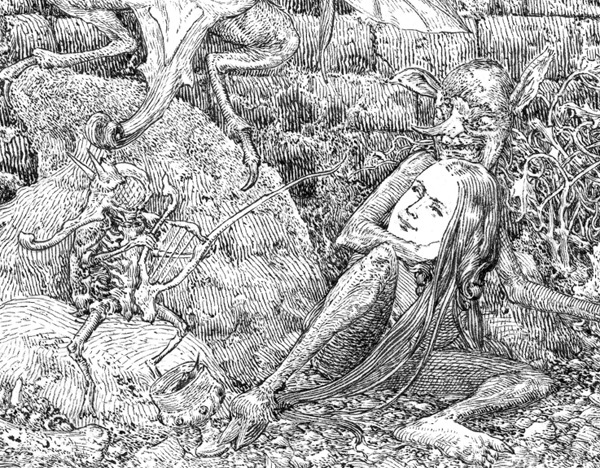 (Detail from Jeremy A. Bastian’s “The Last Witch’s Head at the Wall of Man’s Demise”) Surrounded by miscreants of innumerable varieties and clutched in the hands of a cloven goblin: The Last Witch’s Head! How would you describe your overall experience with Century Guild? I love everybody at Century Guild. 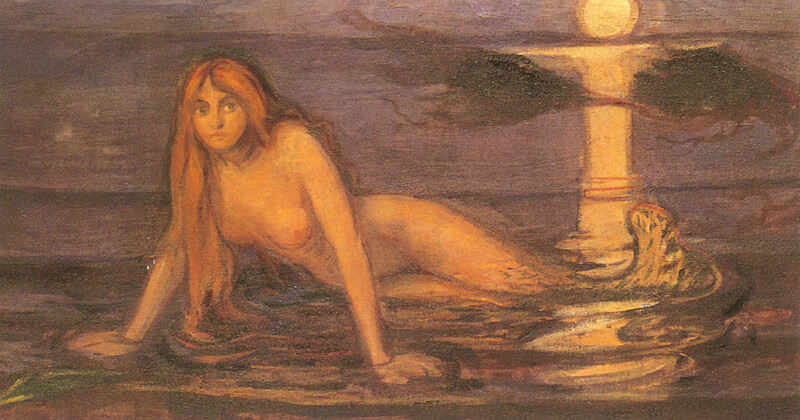 I think that Tom really believes in the artwork, in the character [of Cursed Pirate Girl], and in me as an artist. He’s more into the art world, so he knows how long it can take, and that it’s hard to make a living at what you do when it’s a slow process, especially in the comic book world. So, he helped to get me into the gallery. Part of my goal as a little kid was to be an artist, and I thought that being a comic book artist was probably the easiest way to do that, to draw for a living. It seemed to me, that to be a “gallery artist” there was more chance [being riskier than commercial art in the comic book field] to that. You just have to know the right people and no matter what degree of talent you have, you can still slip through. And with a comic book job it seemed like you could actually make a living. So, they’ve been great… I’ve been really lucky. 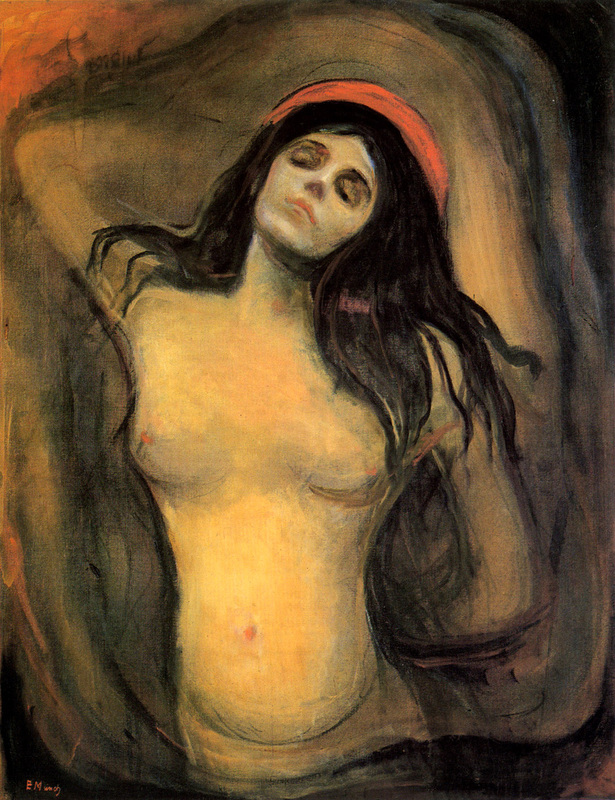 Edvard Munch has long been one of my favorite artists in Modern Art. 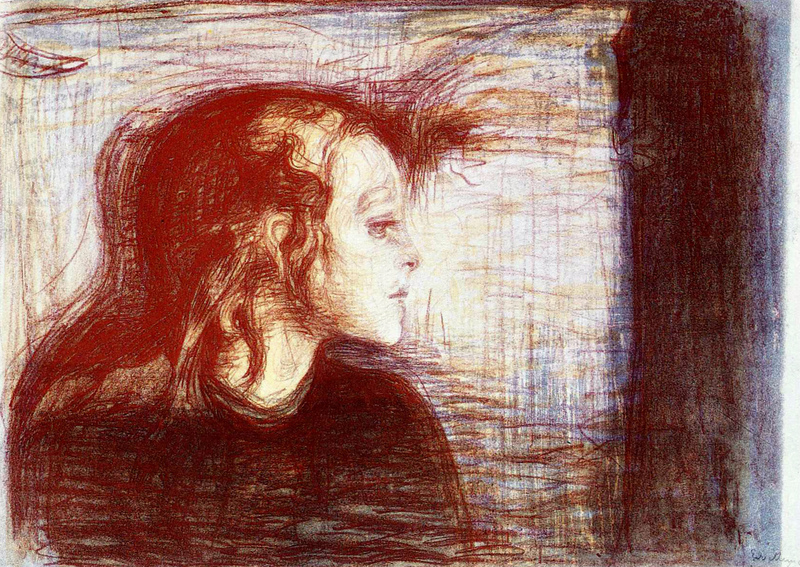 His Symbolist and Proto-Expressionist works have a deeply personal connection with me. 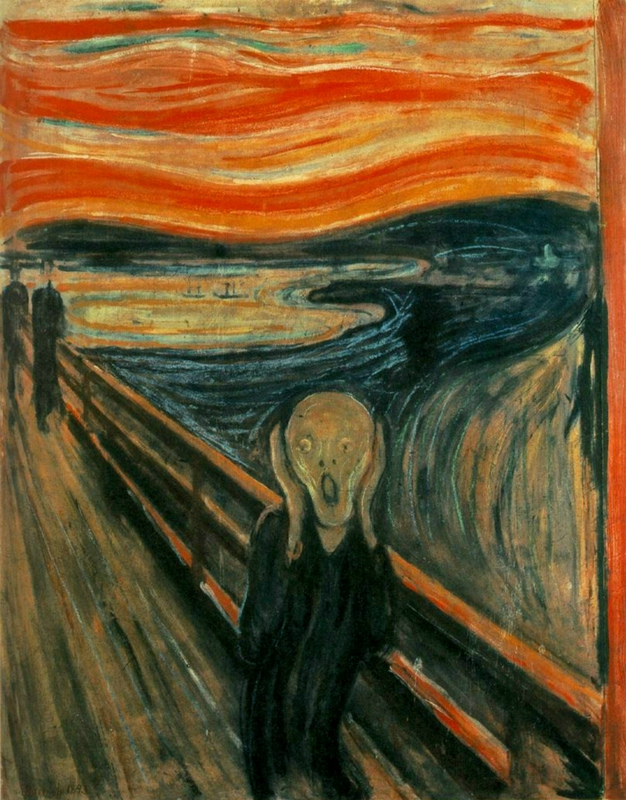 Somehow, they reach into my psyche, wrenching my emotions and thoughts from within and allow them to materialize in paint. 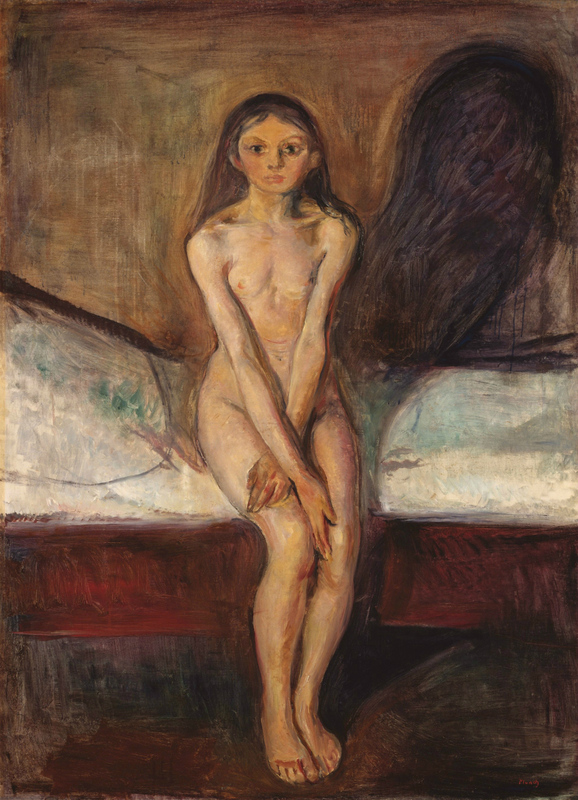 Munch’s art worked on two psychological levels at once, both conjuring up primitive emotions from our personal past while at the same time juxtaposing it with his knowledge of archetypal characters from our collective past. 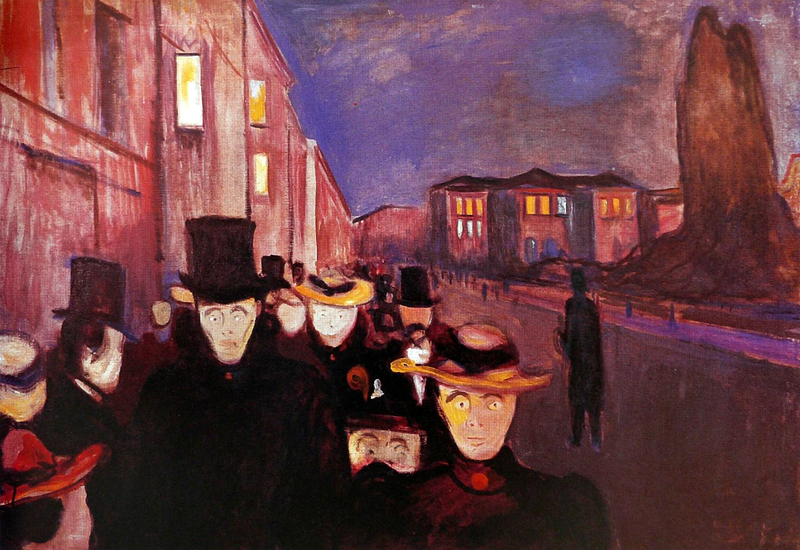 I love the way his artwork, much like Franz Kafka‘s writings, tap into those deep-rooted feelings of inadequacy, guilt, regret, lust, and utter despair. 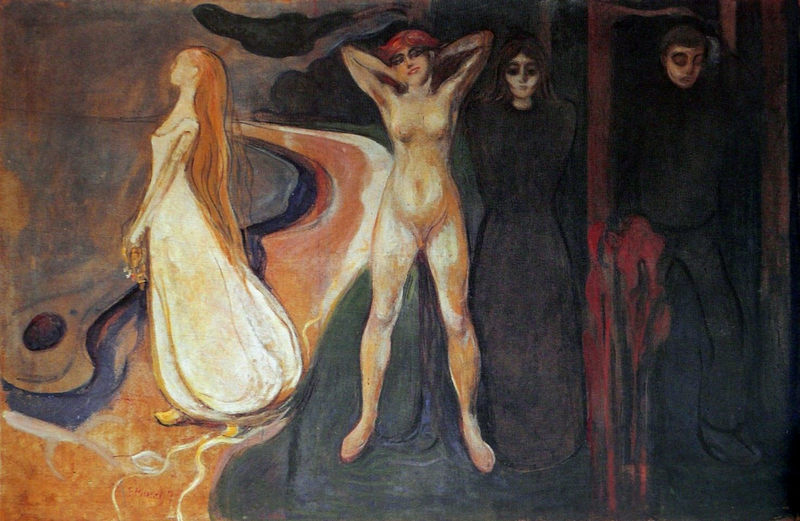 Utilizing bold brush strokes and vibrant colors and contrasting them with ambiguous shadows, Munch’s imagery carries with it all the complex emotions and mysteries of the human experience.